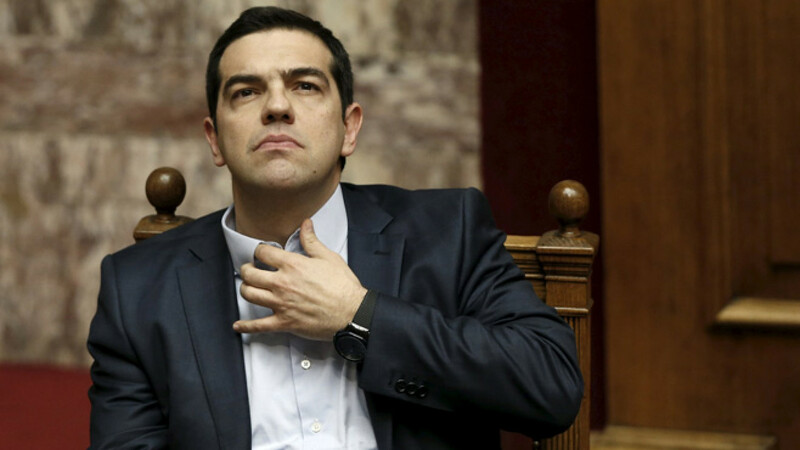 Greek Prime Minister Alexis Tsipras gestures before his speech during a parliament session in Athens Mar. 30. As Greek Prime Minister Alexis Tsipras prepares for talks with President Vladimir Putin during a visit to Moscow beginning on Wednesday, experts, officials and European leaders have been left guessing whether the two men might hammer out an economic deal. 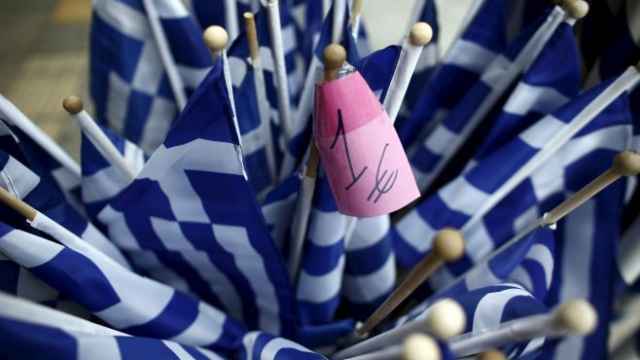 The meeting was announced less than a month ago as crisis-ridden Greece ran into trouble in its debt negotiations with the European Union. Financial aid from the Kremlin would give Athens breathing space in its debt repayments and hand Russia leverage over EU policymaking, but experts and analysts said that the two sides were more interested in grandstanding than a dramatic diplomatic realignment. "Moscow could give Greece money … but it won't solve either Moscow's or Athens' problems," said Vasily Koltashov, head of the Institute of Globalization and Social Movements' economic research center. More likely is a partial lifting of Moscow's food embargo on European imports that would allow this year's Greek fruit harvest, particularly of strawberries and peaches, to find buyers in Russia, and give Tsipras a token victory. Aside from talks with Putin and Prime Minister Dmitry Medvedev on April 8, Tsipras told Russia's TASS news agency last week that he will meet Patriarch Kirill, head of the Russian Orthodox Church, and give a speech at a central Moscow university during his time in Russia. Tsipras also used the interview to restate his opposition to the sanctions the European Union has imposed on Russia over the Ukraine crisis, and call for greater ties between Moscow and Athens. Labeling sanctions a "road to nowhere," Tsipras told TASS that Greco-Russian relations gave Athens a key role in ongoing negotiations. "I really think that Greece, as a member of the EU, can be a connecting link, a bridge between the West and Russia," he said. Tsipras is no stranger to Moscow. The leader, who heads the radical leftist Syriza party, came to the Russian capital last May and met with officials including Valentina Matviyenko, the chair of the Russian parliament's upper house who served as Russia's ambassador to Greece in the late 1990s. Tsipras and Putin will discuss economic ties "in light of Brussels' policy of sanctions and Athens' quite cold attitude to this policy," Putin's spokesman Dmitry Peskov said last week, Reuters reported. Precedent does not favor a big Greco-Russian deal: The last time representatives from a Mediterranean country visited Moscow under pressure from European creditors they went home empty-handed. Cyprus' Foreign Minister Michalis Sarris flew into Moscow in March 2013 in an effort to secure Russian financial aid as Nicosia watched its banking system teeter on the verge of collapse amid negotiations with the European Commission, European Central Bank and the International Monetary Fund. But he left with nothing, and Moscow later acquiesced in a levy on depositors that was imposed on Cypriot banks as a part of restructuring. Russia's economic problems make it unlikely that it will be prepared to commit large sums. Inflation is currently running at levels not seen since the early 2000s, experts predict a 2015 economic contraction of up to 5 percent and reserves fell to almost 8-year lows in March after a collapse in the value of the ruble. Finance Minister Anton Siluanov told Russian news agency RIA Novosti on April 3 that no formal appeal for financial aid had been received from Athens. One option for Moscow during the negotiations would be to cancel the food embargo and grant Greece privileged import access, generating revenue for struggling Greek companies and allowing Tsipras to present a concrete result to Greek voters, according to Koltashov. "This would be a colossal present for Greece," said Koltashov. Greece's economy has suffered from the food embargo imposed by Moscow in August and Greek officials have reportedly spoken of rotting harvests. The export relationship is particularly close in terms of fruit: Greece accounts for 40 percent of Russia's total strawberry imports and 25 percent of total peach imports, according to data from news website FruitNews. Tsipras called for closer agricultural cooperation in his interview with TASS last week. Moscow appears to be not averse to the idea. Unnamed officials told Bloomberg news agency last week that Russia was ready to discuss easing restrictions on Greek food products. A spokesperson for Russia's food safety watchdog, Rosselkhoznadzor, said Monday that the agency was preparing inspections to begin in Greece on April 20 that would be necessary before agricultural exports could resume. Tsipras' visit is supposed to please a domestic audience and bolster his standing in the EU, according to Thanos Dokos, director of the Athens-based Hellenic Foundation for European and Foreign Policy. "But there are also more material expectations in the sectors of trade, investment, energy and defense cooperation," he added. Russian companies have expressed interest in several key Greek assets in recent years, and Tsipras has said that energy and tourism are areas with the greatest economic potential. State-owned gas giant Gazprom was one of the leading bidders for Greek natural gas infrastructure assets in 2013 in a privatization deal that was eventually shelved. Last year, state monopoly Russian Railways announced it was looking to buy a majority stake in the Greek port of Thessaloniki. Any major new Russian investment in Greece would raise hackles in Brussels. The EU and U.S. have previously expressed concern over Russian companies being given control of key Greek infrastructure. The relationship between Moscow and Athens has traditionally been close, partly because of their shared Orthodox faith. Greece has sided with Moscow in several international disputes: Athens has never, for example, recognized independent Kosovo, whose U.S.-backed status Russia condemns. There are approximately 190,000 ethnic Greeks and Pontic Greeks in Russia and there are large Greek populations on the country's Black Sea coast and in the North Caucasus Stavropol region. Russian investment in Greece has ticked up in recent years, rising from $33 million in 2007 to $98 million in 2013, according to the latest available Central Bank data. Experts, however, point out that Greco-Russian relations often promised more than they deliver and that Athens is restricted by its affiliations to both the EU and NATO. "The probability of Greece reorienting itself toward or repositioning itself closer to Russia is practically zero for as long as Greece remains a full member of European institutions," said the Hellenic Foundation's Dokos.